I love salads. They’re a great way to have a healthy meal and really fill up without eating all your Points in the process. But what I don’t love about them is the prep work. There’s chopping, slicing, washing, more chopping…It’s time consuming and messy and I usually am just too beat to bother. Some days, however, it’s nice to have a salad that I can whip together. You know, one of those ones that’s a no-fuss side salad that comes together in no time and goes with about anything? This Thai Ginger Peanut Slaw is one of my absolute favorites of that. First, the convenience of the pre-packaged broccoli slaw mix is a game changer. I don’t know about you, but when I get about halfway through my salad, I’m tired of the lettuce. I love having easy and tasty salad base options that aren’t just lettuce! Broccoli slaw is more than that too, it’s packed with vitamins and minerals and that crunch is just wonderful. The best part, though, is that fact that you just dump the mix in a bowl, toss in some cilantro and you’re good to go! But before you get too excited about the broccoli slaw mix, let’s talk about the incredibly delicious dressing that’s going to rock your slaw. This dressing is not only ridiculously good, but ridiculously easy. It’s got just a few ingredients that you can whisk together in a couple of minutes. And the flavor – oh the flavor! It’s what is going to take the flavor of your salad to a whole new level. It’s creamy, nutty, salty, , tangy, spicy and just a touch sweet. This makes a great side salad. I love the flavor of it and the ease of it. I can have it whipped together in just 10 minutes, so it’s perfect when I need another veggie for a meal. It’s simple, easy, tasty and adds a little crunch to the meal. On the other hand, if you want it to be more than a side salad, it’s just as easy to make it a main dish as a side salad. You could add a little sliced chicken breast, fresh grilled shrimp or even some broiled salmon to this. Adding a little lean protein would make it the perfect main dish for a healthy and tasty lunch. Or, you can keep it a side salad and just add some extra veggies that you’ve got on hand to add variety to it. 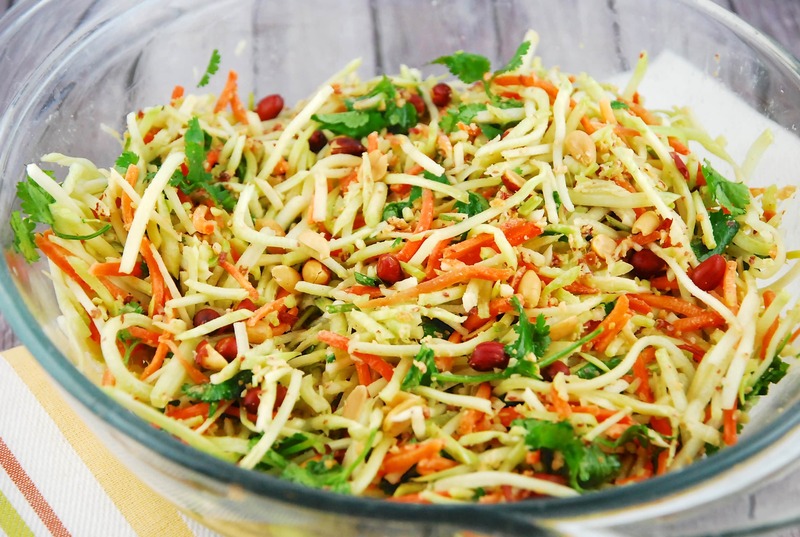 I’m telling you that this Thai Ginger Peanut Slaw is a fantastic Weight Watchers salad recipe. It’s light and refreshing to help keep you on track with your Points. It’s ready to go in just 10 minutes with the bagged broccoli slaw mix and the Thai Ginger Peanut dressing. The delicious peanut based dressing is the star of the recipe with it’s creamy, nutty, tangy and spicy flavor that’s all rolled into one amazing dressing. Thai Ginger Peanut Slaw is a game changer when it comes to salads. Simple and quick to put together without making too many dishes. It’s light and refreshing with a quick and delicious dressing. Enjoy! A quick and easy salad with minimal effort, but maximum taste. The delicious, peanut based dressing is the star of this recipe, boasting a mouthwatering flavor profile. In a large bowl, toss together the broccoli slaw and cilantro. In a small bowl, whisk together the remaining ingredients. Pour dressing over salad and toss to coat. Top salad with chopped peanuts and serve. I was wondering the same thing about fish sauce???? Please fix the print option. For months now, when I try to print all I get is the large photo and the description. No recipe is included in the print. I love your recipes and really want to try them. The ability to print is important to me. Thank you! The article says this salad has a touch of sweet. What would that be? I don’t see anything with sweetness in the recipe? I like the slaw mixes very much too. To me, they are a better topper than shredded lettuce for tacos, chile, etc., and even as a substitute for zoodles as the base for various saucy dishes. Can’t wait to try this salad. The mild sweetness comes from the ginger combined with the peanut butter in the dressing. It is mild though…not as sweet as something you might get in a restaurant. Can this be made with regular cabbage slaw? I’m not a fan of broccoli slaw. I DO love Thai food!! It is my #1 choice when going out for dinner. Absolutely!! I love cabbage slaw too…and the texture is similar to that of the broccoli slaw, so the substitution should work just fine. When you hit print,there will be a dropdown box that says print all or range. I choose range then did 1 thru 4.